Abstract. Bedrock erosion by sediment-bearing subglacial water remains little-studied; however, the process is thought to contribute to bedrock erosion rates in glaciated landscapes and is implicated in the excavation of tunnel valleys and the incision of inner gorges. We adapt physics-based models of fluvial abrasion to the subglacial environment, assembling the first model designed to quantify bedrock erosion caused by transient subglacial water flow. The subglacial drainage model consists of a one-dimensional network of cavities dynamically coupled to one or several Röthlisberger channels (R-channels). The bedrock erosion model is based on the tools and cover effect, whereby particles entrained by the flow impact exposed bedrock. We explore the dependency of glacial meltwater erosion on the structure and magnitude of water input to the system, the ice geometry, and the sediment supply. We find that erosion is not a function of water discharge alone, but also depends on channel size, water pressure, and sediment supply, as in fluvial systems. 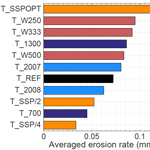 Modelled glacial meltwater erosion rates are 1 to 2 orders of magnitude lower than the expected rates of total glacial erosion required to produce the sediment supply rates we impose, suggesting that glacial meltwater erosion is negligible at the basin scale. Nevertheless, due to the extreme localization of glacial meltwater erosion (at the base of R-channels), this process can carve bedrock (Nye) channels. In fact, our simulations suggest that the incision of bedrock channels several centimetres deep and a few metres wide can occur in a single year. Modelled incision rates indicate that subglacial water flow can gradually carve a tunnel valley and enhance the relief or even initiate the carving of an inner gorge. How to cite: Beaud, F., Flowers, G. E., and Venditti, J. G.: Efficacy of bedrock erosion by subglacial water flow, Earth Surf. Dynam., 4, 125-145, https://doi.org/10.5194/esurf-4-125-2016, 2016. In regions formerly, or currently, covered by glaciers, landscapes have largely been shaped by glaciers. Glaciers erode bedrock through three main mechanisms: abrasion, quarrying, and subglacial meltwater erosion (SME). The latter, however, remains enigmatic. We present the first numerical modelling study of bedrock erosion by subglacial water and find that SME is negligible compared to abrasion and quarrying across the glacier, but its localization can explain the formation of bedrock channels.